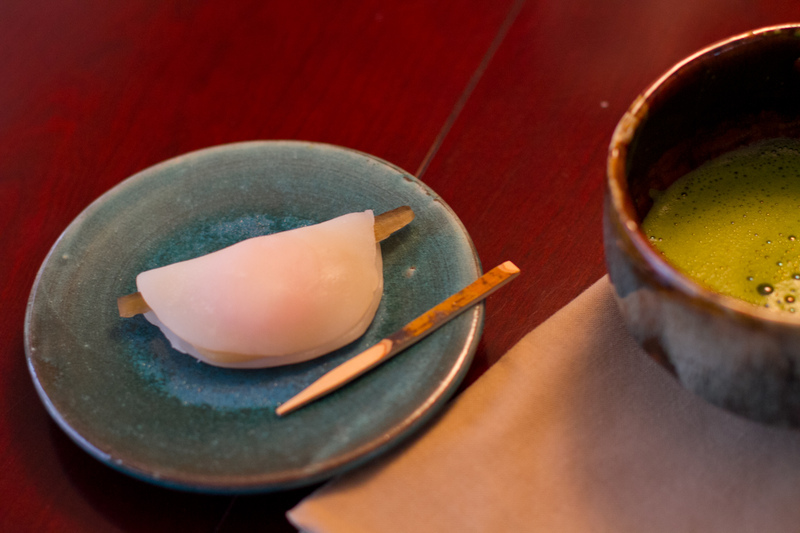 Hanabira mochi is traditionally only served during the new year’s holiday. It contains gobo (burdock root) and miso mixed with anko (sweet bean paste) in the center. Sounds odd but it’s wonderful with matcha. Last week, I received a gorgeous gift from a dear friend in Japan. She sent me the book Wagashi by Hajime Nakamura. It brought me to tears, then I was tearing through the book to see all the gorgeous seasonal wagashi. 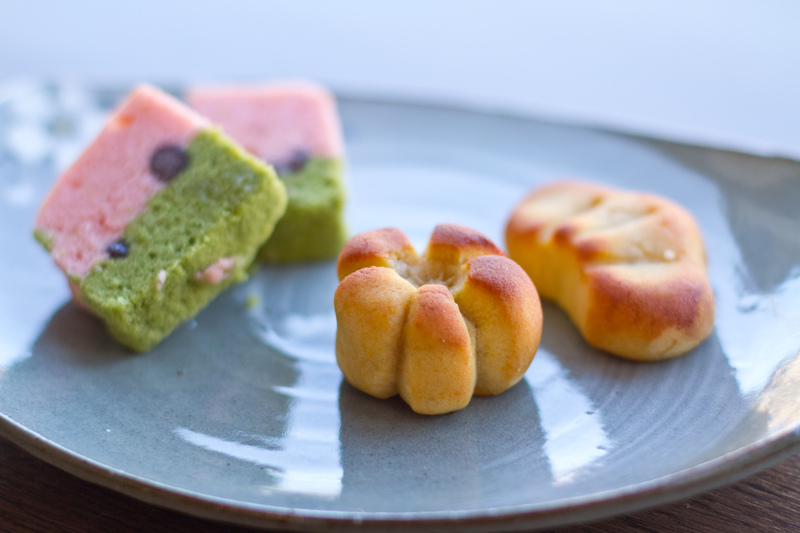 Wagashi, or traditional Japanese sweets, was given its name with the introduction of European culinary traditions. 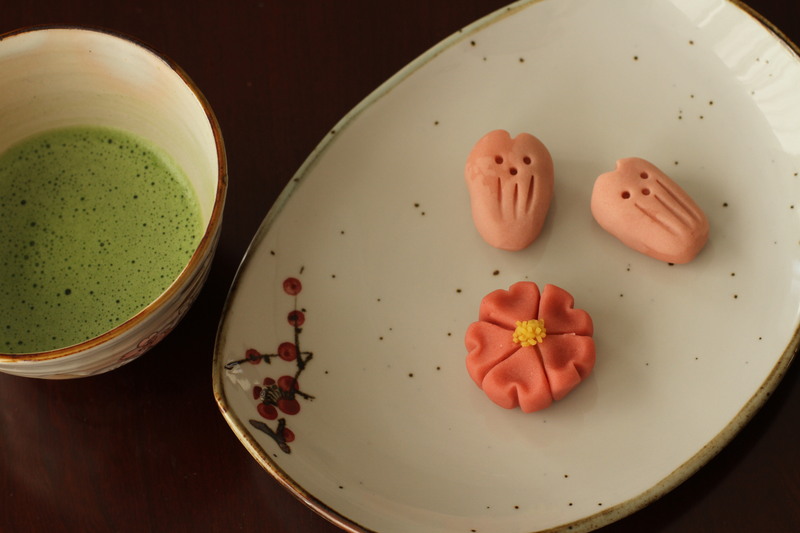 Wagashi is very sweet confections prepared in old Japanese ways that were typically served along thick (koicha) and thin (usucha) matcha during tea ceremony. These sweets tend to contain no oil, many come without eggs and all are prepared with an incredible attention to detail. Two main ingredients are mochi (sweet glutinous rice flour) and anko (bean paste). The consistency of wagashi can vary from very soft to hard candies. There is no hard rule but typically softer wagashi is served with thick tea and harder wagashi with thin tea. While many wagashi sweets can be found all over Japan, there are several varieties that are regional or seasonal. The very fancy wagashi tends to focus on the season; either made to mimic a blooming flower, a flavor available only during that time of the year, or providing “coolness” during hot summer days and vice versa. I was lucky enough to take a yearlong wagashi class through Better Homes during my time in Japan. Even though it was all in Japanese, I learned a lot about how wagashi is prepared, the attention put into each individual piece and being able to enjoy these morsels with friends and tea ladies. I already loved trying new wagashi but the class gave me an appreciation of those preparing these gorgeous sweets I enjoyed weekly during tea lessons. If you have a chance while in Japan, I recommend taking a wagashi cooking class in one of the major cities (Kyoto, Tokyo) or stopping by the wagashi bar at Coredo building in Tokyo. The wagashi specialist will quickly whip up the wagashi of your choice in front of you. It’s almost too beautiful to eat…but I said almost. It’s delicious. Enjoy it! Ukishima (“floating island”) has azuki beans floating in the cake and momoyama scented with yuzu flavor. Classic Japanese sweet. Substitute the strawberry for other seasonal fruit. I particularly like persimmons. My absolute favorite sweet from Kyoto! These lightly-flavored triangles come in a variety of flavors. The original is cinnamon but you can now find matcha, black sesame, chocolate, sweet potato and many other seasonal flavors. Mizu yokan is a great basic recipe (you can omit matcha and replace with your own flavor) that you can use to create numerous different flavors. Try pickled sakura flowers in the spring or yuzu in the winter. If you’re feeling super ambitious, try this traditional sweet. You create a gelatinous sweet that is then used to cover the anko. I made these in my wagashi class and they are delicious but very time-consuming. Perfect if you’re trying to impress your friends at a tea party!